Election Commission officials checked a vehicle in which Karnataka Chief Minister HD Kumaraswamy was travelling but found nothing incriminating. 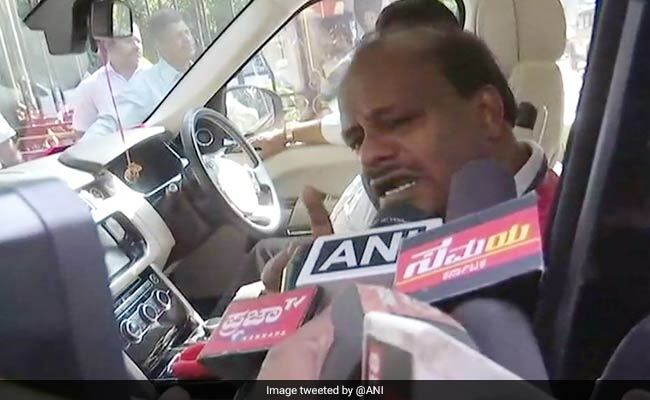 Election Commission officials checked a vehicle in which Karnataka Chief Minister HD Kumaraswamy was travelling but found nothing incriminating, an official said on Thursday. "It was a routine search at the Channarayapatna check-post on the Bengaluru-Hassan highway. We daily check vehicles of all political parties, their leaders and candidates to ensure they observe the Model Code of Conduct," Election Commission official NS Darshan told news agency IANS over the phone from Hassan, about 180 km from Bengaluru. Besides Mr Kumaraswamy's Range Rover, the three-member EC team also searched on Wednesday 14 other vehicles which were part of a convoy going to Hassan to campaign for Prajwal Gowda of the ruling Janata Dal-Secular (JD-S), who is contesting from the key constituency. "We stopped the vehicle and checked its dicky and open spaces. As we found nothing in it, we allowed it to cross the check-post," said NS Darshan. On being stopped, Mr Kumaraswamy asked the EC team to check not only his personal vehicle but also those of his party leaders in the convoy and report to their higher authority if anything illegal was found. Hassan will vote on April 18 in the first phase of polling along with 13 seats in the central and southern regions of the state. Prajwal Gowda is the grandson of JD-S supremo HD Deve Gowda and son of state PWD Minster HD Ravenna. He is Mr Kumaraswamy's nephew. To enable Prajwal Gowda to contest for the first time from his home town (Hassan), the 85-year-old HD Deve Gowda shifted to the Tumkur Lok Sabha seat, about 70 km northwest of Bengaluru, after representing it (Hassan) for a record six times since 1991. Mr Kumaraswamy's son Nikhil Gowda, an upcoming Kannada-Telugu film actor, is contesting from the Mandya Lok Sabha constituency, about 100 km from Bengaluru, on the JD-S ticket. Nikhil Gowda, 29, is pitted against 55-year-old multilingual south Indian actress Sumalatha Ambareesh, widow of rebel Kannada star Ambareesh, who died on November 24 in Bengaluru after a brief illness.